The World Bank (WB), the International Monetary Fund (IMF) and the World Trade Organisation (WTO) have influenced the Colombo-based unitary system to prepare ‘Vision 2025’, a policy which gives a face-lift to the ‘development paradigm’ of genocidal Sri Lanka. The drafters of SL Constitution, engineering ‘reforms’ in the unitary system, are also the agents serving the external masters. The new constitution is going to be the bed-rock for many more so-called reforms and Acts to be enacted in future to permanently lock the island as a single-unit into the bandwagonism of the West. New Delhi has already been locked in the grid as a ‘Strategic Partner’. 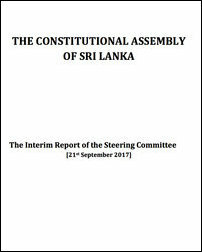 The interim report on the constitutional discourse should be seen coupled with ‘Vision 2025’, launched in September jointly by SL President Maithripala Sirisena and Prime Minister Ranil Wickremesinghe. The attitude and conduct of ITAK Parliamentarian M.A. Sumanthiran as a ‘process manager’ handling Tamil polity in the constitutional framework, also needs to be interpreted in a broad sense, both in terms of time and political space. Sumanthiran was not an actor who entered the political scene after 2009 as many tend to interpret or imagine. Mr Sumanthiran had been prepared by the West long before the 2002 CFA agreement. He was in fact deployed to advocate the Oslo Declaration model already at that time. The trend of the current constitutional discourse was clearly evidenced already in 2013 in Singapore principles to which ITAK’s Sumanthiran and UNP’s Jayampathy Wickmaratne emerged as chief proponents along with collaborating sections of Tamil diaspora organisations that have no grass-roots backing. The immediate aim of Singapore principles was achieving a consensus on trapping Tamil voters through the ITAK (TNA) for the regime change that followed in 2015. "In January and August 2015, people of Sri Lanka exercised their franchise in a decisive manner, marking historic milestones in our country’s journey," the Vision-2025 document notes. It continues to explain the ‘reformist’ line of the genocidal unitary system: "[s]ome of our promises have already been fulfilled. Chief among them are the restoration of Sri Lanka’s image on the international stage, the 19th amendment to the constitution, the setting up of independent commissions, the Right to Information Act, the restoration of the freedom of expression, public consultations on the proposed reconciliation mechanisms and the constitution, the setting up of the constitutional assembly, measures to rid our nation of corruption and usher in a culture of good governance." The ITAK (TNA) under the control of M.A. Sumanthiran has in fact contributed to the "restoration of the image of Sri Lanka on the international image" through its Quisling Politics. There are enough evidences exposing Mr Sumanthiran acting to weaken the Tamil demand for genocide investigation. However, Eezham Tamils have not been fully enlightened on the ulterior motives of the global establishments and the real depth of the role played by their agents. Genocide denial was an integral part of the Geneva-based human rights discourse managed by the soft-power diplomacy of the West. The war-crimes approach was designed to find fault with both the parties to the armed conflict. The Geneva discourse was also part of the larger designs and was conceived with the denial of Right to Self-Determination to Tamils. This has been clearly spelt out by none other than Louise Arbour, who was UN Human Rights chief (1999 - 2004) and later the president and the CEO of the International Crisis Group (2009 - 2014). Her address detailing the ICG approach at Carnegie Council in September 2010 is a prima facie evidence to the approach denying Tamils right to Self-Determination. Now, Eezham Tamils face the next move in this roadmap charted by the US bandwagon is a referendum in consolidating the genocidal and unitary system of ‘Sri Lanka’. Eezham Tamils who have a history of not surrendering their sovereignty by refusing to accord democratic mandate to the constitutions of Sri Lanka in the past are now going to be trapped to take part in a referendum on "undivided and indivisible Sri Lanka". The Vision 2025 document continues: "We will introduce supportive legal reforms. In particular the new Inland Revenue Act, Foreign Exchange Act, Voluntary Disclosures of Income Act, State Land Bank Act, Anti Dumping Act, State Commercial Enterprises Act, Ports and Airports Act, Ruhunu Economic Development Corporation Act, Lands (Special Provisions) Act, Sustainable Development Act, Liability Management Act, and National Debt Office Act will considerably improve the business-friendly environment." 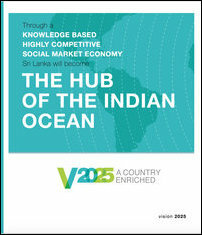 It describes the policy as ‘Social Market Economy’ and the document is one of the indicators on how the global agenda-setters have envisaged the roadmap of the so-called reforms being talked about in the island. Colombo has already started to occupy lands for Sinhalicisation of the occupied homeland of Eezham Tamils through what it calls Public Private Partnership (PPP) initiatives as envisaged by its Vision 2025. "We will encourage the private sector to modernise the agriculture sector, and to introduce efficient and stable modern value chains through models such as trader-farmer contracts, contract grower systems, and agriculture mega zones. We will introduce an Agriculture Logistics Network (ALN) through a PPP that incorporates state-of-the-art solutions for storage and transportation, ICT to improve information asymmetries, and real-time monitoring for effectiveness," the policy document states. The agenda-setters want Eezham Tamils to get deceived, contained and not become ‘spoilers’ of their roadmap towards fitting the island as a single-unit in their grid of global monopolism. Terms are not important to them, only the end result. The end result is nothing else than a Colombo-centric system plugging the elites of every community, including the diaspora of Eezham Tamils. Norway, formally claiming as a facilitator, but was playing a mediator role in practice, was behind the so-called Oslo-Declaration in December 2002. The attempt then was to lock the LTTE into accepting indivisible ‘Sri Lanka’ through deploying the term ‘federal’ coupled with the notion of ‘internal right to self-determination’. Instead of ‘unitary’, there was the term ‘united’. Limiting the scope to ‘Internal Right to Self-Determination’ alone and stating that it was LTTE leadership which was behind a such request was in fact a move of making the Tamil side to denounce the claim of nationhood and sovereignty. The logic of 2002 Oslo Declaration was: United + Internal Right to Self-Determination = Unitary with federalist character / undivided ‘Sri Lanka’. The text of the Oslo-Declaration was composed by Erik Solheim and Milinda Moragoda, as revealed by Mr Solheim himself years later. New Delhi was also regularly briefed by the agents of the soft-power diplomacy of the West, according to him. LTTE leader V Pirapaharan didn’t succumb to the cunning move of making the negotiating Tamil party agreeable to the roadmap of indivisible ‘Sri Lanka’ and he directed the LTTE towards the ISGA model. The course-corrected discourse of the roadmap was finally sabotaged by the moves taken by Chandrika Kumaratunga, the president of the GoSL in 2004. Instead of using the terms and making the parties agreeable to a federal model within the unitary system, the Co-chair Establishment of the West landed on an approach of evading terminology. This is known as the non-descript approach. Robert O Blake, the former US ambassador in Colombo as far back as 2007went on record stating that solution to the ethnic conflict should be found in a manner that avoids the use of terms like "federalism" and "unitary". Integral to this approach articulated by Mr Blake was also the denial of Tamils right to self-determination and the refusal to look into the question of genocide. The agents of soft-power diplomacy of the West have since been consistently articulating for the non-descript approach even before the genocidal onslaught in 2009. It was clear that the genocidal onslaught was influenced by the World Bank and IMF, which shaped the policy outlooks of managing the peace as well as the war in the island. Descript or non-descript, the approach envisaged by the bandwagonist Establishment has been the same since 2002 Oslo Declaration to Singapore Principles in 2013 and to Colombo’s Interim Report on Constitutional Reform in 2017. The approach of the West is denouncing Tamils’ Right to Self-Determination, denying genocide investigation and thereby denying historical, earned and remedial sovereignty claims of the nation of Eezham Tamils. Achieving a negotiated settlement based on distinct sovereignty of Eezham Tamils as a nation with the Sinhala nation in the south is not a priority for the US bandwagonism, which is pre-occupied with global and planet monopolism. But, for India, which is having its closest coast with the nation of Eezham Tamils, it should be a question of national security. Rather than being concerned of having to deal with a single-unit that could go in its entirety to serve the interests of its adversaries, striking a diplomatic balance of equality on the basis of sovereignty of two nations in the island should have been its foreign policy approach. Maintaining the power of diplomatic balance between the two historic nations in the island. But, New Delhi’s foreign policy attitude towards Eezham Tamils has so far been either that of a dog that missed the squirrel (A'nil ea'ravidda naay) or that of a dog in the manger (Vaikkal paddadai naay). At a meeting held in Jaffna on 11 February 2017, Mr Sumanthiran defined the ‘optics of TNA diplomacy’ as not urging India to exert pressure on the regime in Colombo to deliver a political solution to national question. He said even his previous visit to New Delhi was representing a ministerial delegation of ‘Sri Lanka’ to New Delhi. This is not an act of being conditioned by New Delhi, but an attempt of being conditioned by the West, comment Tamil political observers in Jaffna. In March 2015, NPC Chief Minister C.V. Wigneswaran was addressing the public in front of visiting Indian PM Narendra Modi. Wigneswaran openly requested Mr Modi to initiate talks involving the governments in New Delhi, Colombo and the Northern and Eastern Provinces to "find ways of resolving the central problem of the Tamil speaking people in an innovative and creative manner bearing in mind the root causes of our ethnic conflict". The approach of the US bandwagonism is to approach the affairs of the entire island through Colombo. Vision-2025 envisages a Colombo-centric State-within-State model based on Western Megapolis project and the Colombo International Financial Centre (CIFC), which are to take centre-stage in the grid. Justice Wigneswaran seem to have realized the designs of the IMF. On 19 May 2017, he was confronting Ranil Wickramasinghe, who was talking about a ‘new system’ of IMF negotiated scheme of incentives to invite [southern] investors into Jaffna at a special meeting convened for District Secretariat officials in Jaffna. The recently exposed CEPA attempt to undermine the Northern Provincial Council through plugging a section of Tamil diaspora into the Colombo-centric approach of containment was also seen as part of larger designs of the external State-funders to the initiative which was successfully check-mated by Eezham Tamils. The plot to unseat Justice Wigneswaran from the position of Chief Minister was also successfully confronted by the grassroots in the North. Conceiving the road for the liberation of Eezham Tamils with such success milestones will bring the Tamils closer towards descript and defined solutions. Both the West and India would be forced to mend their ways and outlook towards the nation of Eezham Tamils. Being struggle-centric and acting independent, rather than being subjected to the syndrome of getting colonially conditioned, is the attitude needed to chart the roadmap towards liberation. 04.07.17 Understanding ‘Quisling politics’ and facing it with ‘Navara..
08.06.17 Netherlands-funded CEPA project wages political ‘counter-ins..
04.06.17 IMF agenda, new SL Finance Minister to manipulate Diaspora T..
19.09.15 Sumanthiran acts to weaken Tamil demand for genocide investi..
25.07.15 Colombo-centric ‘State within State’ is model envisaged for ..
13.03.15 New Delhi should stop looking at Eezham Tamils through Colom..
22.01.15 Singapore Principles of 2013: Tamil polity taken for ride fr..
08.10.17 SL constitutional discourse seen coupled with ‘Vis..
04.07.17 Understanding ‘Quisling politics’ and facing it wi..
20.06.17 Global ‘environment funds’ deployed by Colombo to ..
19.06.17 NGO activist in Jaffna urges Tamil diaspora to be ..
18.06.17 Colombo regime, West-funded CEPA, ITAK minister be..
17.06.17 Time is running out for ITAK to re-orientate itsel..
16.06.17 Jaffna at standstill, people rally at Nallloor in ..
15.06.17 Justice Wigneswaran vows to stay the course despit..
14.06.17 NPC plunges into crisis as external agenda-backed ..
08.06.17 Netherlands-funded CEPA project wages political ‘c..
05.06.17 Colombo eliminates NGO independency in North-East ..
04.06.17 IMF agenda, new SL Finance Minister to manipulate ..
21.05.17 Western funding deployed to suppress voices of Tam..